Yeow. Today our car caught on fire. Everyone is ok. The car is ok. The battery melted and now we have a new one (battery that is). It was kind of scary....! 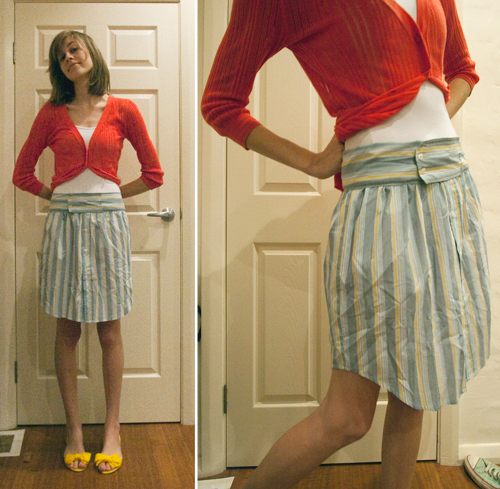 So for my creative task today I made a skirt from one of Mr Peck's old shirts. Pretty happy with it, the waistband just doesn't sit flat... grrr, always something!!! But now I have a new skirt and it didn't cost me a cent.. .so that's pretty cool! Apology for the photos.. it's dark and cold and yeh.. .hehe I'll try and get some better ones later.